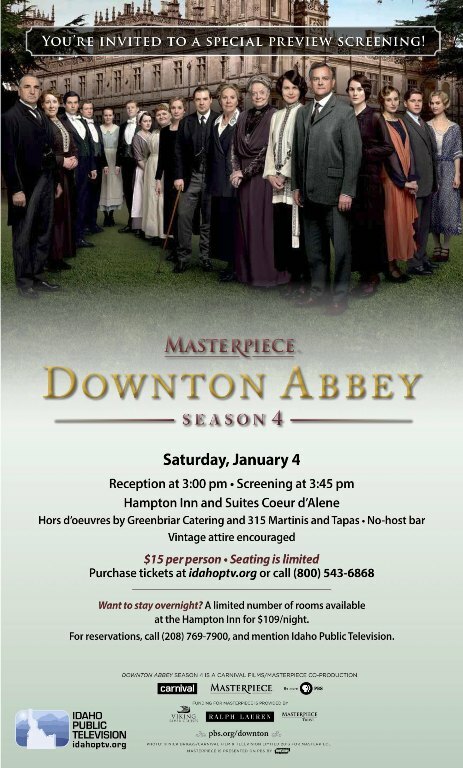 Tue., Dec. 31, 2013, 9:24 a.m.
Idaho Public Television invites Downton Abbey fans to come to a special reception and preview party this Saturday at 3 p.m at the Hampton Inn at Riverstone in Coeur d’Alene. Coeur d’Alene is one of two sites in the state to be selected for a special one-hour preview of the new Masterpiece Downton Abbey season 4 which begins on PBS next week. Saturday’s event begins at 3 p.m. with a reception, British hors d’oeuvres, music by Coeur d’Alene Charter Academy students, and a no host bar. The screening of the first episode will begin at 3:45 p.m. Prizes will be given to the best vintage outfits. Tickets are $15 and should be purchased by Dec. 31 online at www.idahoptv.org or by calling (800) 543-6868. Question: Which major character do you expect 'Downton Abbey' to kill of this year? Posted Dec. 31, 2013, 9:24 a.m.